The following diagram shows our complete grease fitting extension hose system. These components work together to relocate grease fittings to any convenient location. Everything shown in black is included when you purchase a ready-to-install grease fitting extension hose. Items shown in blue are optional accessories. 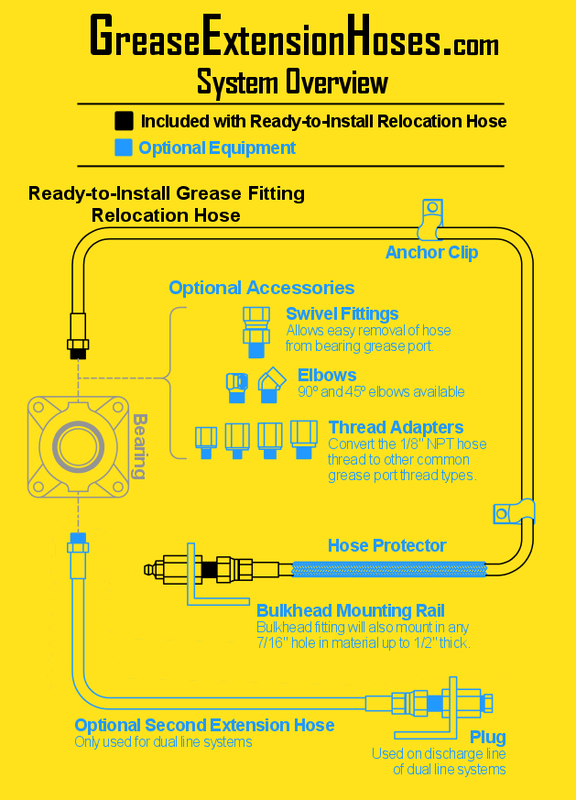 How it works: Our grease fitting extension hose system makes it easy to relocate grease fittings. Relocate Zerk fittings from hard-to-reach locations to any easy-to-reach location of your choice. Many applications only require one item: our custom-length ready-to-install grease fitting extension hose. We also carry many different types of fittings and accessories to make our system compatible with nearly any equipment or field condition. Both ends of our grease extension hose system use a 1/8″ NPT thread. All fittings and thread adapters use the same thread. Because all components use the same thread, all components are compatible with all other components of the system. When a bearing’s grease port requires a different thread, a single thread adapter will be required. These thread adapters makes our 1/8″ NPT system compatible with the most common grease port threads. There is an included grease Zerk fitting on the bulkhead end of our extension hoses. The included Zerk fitting can be replaced with a 90º, 45º, button head, or any other style of grease fitting. Because our entire grease extension hose system uses a 1/8″ NPT thread, any grease fitting with a 1/8″ thread will be compatible.